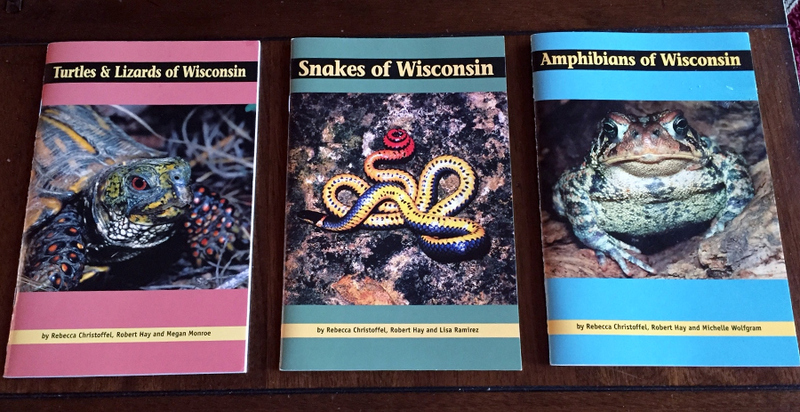 After writing about snakes, turtles and frogs, I’d be remiss if I didn’t touch on the topic of lizards and salamanders of Wisconsin. The lizards are reptiles and in the same Class as snakes and turtles while the salamanders are amphibians and close relatives to the frogs. Wisconsin is the home of four species of lizards. The “Western Slender Glass Lizard” is legless and is sometimes mistaken for a snake. Unlike snakes however, our lizards have external ear openings and moveable eyelids, allowing them to “blink”. “Legged” lizards also have toenails, allowing them to grasp slippery surfaces. The “Prairie Racerunner” is the fastest of the lizards and can travel on hard surface at a speed of 18 miles per hour. The “Five-lined Skink” reaches a length of 8 inches and has 5 yellow striped lines down the length of its body, thus their name. Our most common lizard and the one I have seen the most in our area is the “Northern Prairie Skink”. This lizard has wide tan stripes running down its back with thin and thick black lines ending in a blackish tail. They lay leathery shelled eggs which hatch in moist surroundings. While our lizards will eat just about anything, most of their preferred food is insects. If a predator attacks them, they can lose and later regenerate their tails. Once the tail is separated from the body, it will continue to “wiggle” keeping the predator distracted while the lizard makes its escape. All of our lizards are endangered, restricted in range, uncommon and declining! While frogs are the better known amphibians, there are seven species of animals that make up the salamander side of that grouping. These include the Blue-spotted Salamander, the Spotted Salamander and the Eastern Tiger Salamander which are included in the “Mole Salamander Family”. The Central Newt is the only member of the newt family in Wisconsin, while the Lungless Salamander Family has the Four-toed Salamander and the Red-backed Salamander. The Mudpuppy makes up the last Wisconsin salamander grouping and is also known as a “Waterdog”. The Mudpuppy is the largest and only totally aquatic salamander. I can remember as a kid, fishing the Chippewa River and occasionally hooking into a mudpuppy. I would cut the line before having to handle the slippery creature and remove the hook. While entirely harmless they do look intimidating! The lizards and salamanders in Wisconsin are very secretive and seldom seen but they do make up a vital part of the animals of Wisconsin. They need to be protected and the habitat they require needs to be maintained and expanded. These are just a few of the unique animals that call Wisconsin home! 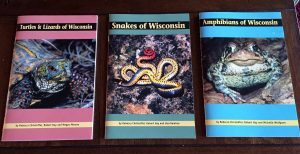 The Bureau of Natural Heritage Conservation, a subdivision of the Wisconsin DNR, provides three excellent reference books on snakes, amphibians, turtles and lizards at very reasonable prices. I strongly urge you to “google” them to check out these outstanding offerings!